My husband Matt and I belong to a Jeep Club in San Antonio. They had arranged a trip to Corpus Christ and Port Aransas last weekend. We had been so slammed during the week, we thought about not going on the ride, since it was a 6am start and we wouldn’t get back till late that night. Then however, we thought about the oil spill in the Gulf and how it hadn’t reached Corpus Christi or Port Arthur yet and we should go down and enjoy the beach while it was still clean. So we got up at 6am and headed to the meeting point on the SE side of town. We met up with another 5 jeeps and headed south. When we got to Corpus, we met up with the local Corpus Christi chapter. So we now had about 10 jeeps cruising up and down the beach. We set up some easy ups and everyone sat and relaxed for a bit after the drive. The weather was perfect. It wasn’t brutally hot, there was a pleasant breeze, and the water was a balmy 86 degrees. Everyone took advantage of the crystal clear water, while discussing the possible effects of the oil spill hitting the coast line. We saw little four wheelers going up and down the beach with turtle flags on there. Matt actually saw a large sea turtle swim next to him while he was out in the water. It’s currently turtle season, and the four wheelers were a sea patrol dedicated to making sure that when the turtle beach themselves that they don’t get run over by people like us driving up and down the beach. I’m really hoping the spill doesn’t make it to the Texas coast. When I first moved to Texas 10 years ago, there was lots of oil on the beach. They actually had cleaning stations where they provided alcohol to wipe your feet before going back to your car. I had a pair of beautiful shoes ruined by the oil. There’s been a real effort to clean up the gulf and keep it clean. Scuba Divers even use the oil platforms to dive on. I can’t imagine the effect of the oil spill on the Scuba industry. With so many places to dive in the gulf, from the artificial reefs off the coast of Pensacola in Florida down to the Oil Rigs and Hammerhead dives off South Padre Island. In between the two are many Scuba shops and dive centers who’s livelihood is going to be severely affected by the spill. Then there’s the affect to the marine life. Sure, there’s a small amount of oil leaking naturally in the gulf all the time. But nothing of this magnitude. From the abundance of wildlife on the Texas Flower Gardens to the manatees off Central Florida, the impact of the spill is going to be huge. If you live near the beach, go enjoy it while you can. Once Hurricane season starts, there’s no guessing where the oil will end up. There are several civilian efforts to help clean up the coast. If you’d like to get involve with the cleanup, check out some of these places. If you have a better list of volunteer opportunities, please reply below so that we can share the word. While at the day job today, looking at techie type sites, I found a link to something actually fun. There’s an underwater webcam in Bonaire. It’s about 15 meters below the surface at a dive site called “Something Special”. The local dive instructors keep it clean, so that must be fun to tune in as people are down there diving. I always like watching webcams while I’m at work. I used to try to watch the Bra Boys surfing at Maroubra Beach in Australia, but with the time zone difference, it was normally dark. Tuning in at sunrise or sunset is pretty awesome though. But, for those of us who’d prefer to be diving instead of sitting at our desk, maybe the Bonaire Underwater Webcam can help keep us amused. It’s gotta be better than a goldfish. Maybe I’ll have to use my second monitor to just show this….You can set the screen to refresh anywhere from 2 seconds to 5 minutes, depending on your connection. On 2 seconds, you can actually see the fish moving around. If you’ve found any neat underwater webcams you’d like to share, let me know. We could all use an escape from the office. 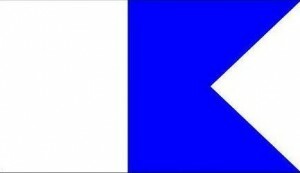 Diver Down or Signal Flag Alpha? Since I’m headed to Australia soon, I was thinking about the differences in Diving between the US and Australia. The biggest difference, is probably in the Flags used by divers. I always thought most people recognized the Red and White Diver Down flag. However, after doing a shore dive off Magnetic Island on one of my trips home, where some British Backpackers tried to kill me with their jetski by doing doughnuts around our dive flag, I worked out that perhaps it wasn’t as universal as I thought. Turns out in countries like Australia, the Signal Flag Alpha is the more recognized flag. At least out in the open water. It’s a Universal Maritime flag that means that a vessel has limited maneuverability due to a diver in the water. Of course, this probably doesn’t help a couple of British backpackers who have rented a jetski for the day. They probably wouldn’t have recognized either flag, since all one needs to rent a jetski is a land drivers license. Maybe when operators rent Jetskis, they should be required to inform renters of Dive flags, to avoid potential accidents. Next time you go diving, check out which flags are being used locally. Even in Australia, it seems Dive Operators that cater to International Tourists use the Diver Down flag. It’s on their shop window, on their T-shirts, painted on their boats. But they may still fly the Signal Flag Alpha while out diving. In the US, most people only use the Diver Down flag. There’s nothing that says you can’t use both. So next time you’re out diving, feel free to use both flags. Then, whether you’re dealing with locals or tourists, hopefully they’ll recognize one of them, and steer clear of you. 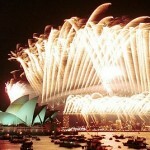 Well, it’s already 2010 in my homeland. I logged on to see how it went in Sydney, and it’s funny that a Scuba article was right there on the front page. 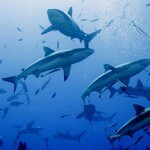 A story about diving with Sharks. I’ll take it as a sign that I’m going to get a lot of diving done this year! I sure hope so. I had meant to get a bunch of diving in last year, but taking a job at a SEO company and teaching acting on weekends ate up all my time, and I ended up not getting my feet wet at all. This year, I’m not going to let anything get in my way! In February I’ll be headed up to the Texas Dive Show. The one in Houston 2 years ago is where I met so many fabulous people who helped get Going Down started. I hope to meet some new wonderful people this year. Double bonus that it’s also on Valentine’s weekend so Matt and I get to go somewhere out of town together! We’re working on some new ways to get Going Down funded so we can go out and just get filming. As all you divers know, Scuba isn’t exactly cheap. It’s even more expensive when you’ve got a crew to feed! While the idea of Going Down is Scuba Diving locally on a budget, we’re not local to every location, so we’ve got more expenses that the average diver. So instead of looking for a financial sponsor for the entire series, we’re now thinking about partnering with people for individual episodes. This makes it much easier for companies to get their name out there. It also helps localized companies. It should be a win-win for everyone invloved. We can get out there and film each episode and the budget allows, and you don’t have to wait for us to have enough money for 13 episodes before we get out there! Well, Happy New Year Everyone! May 2010 bring you many adventures, both in Diving and on land. Be Safe, Be Happy and Have Fun! The Camp CDE page is up. 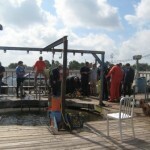 Last year I got to go spend the weekend at Camp CDE, a Commercial Diving Experience Fantasy Camp in Houston, TX. Even though I had a mild panic attack because David couldn’t make it at the last minute, my local hire cameraman did show up, and the Camp CDE people had the underwater remotely operated vehicle that had a camera inside, so I was able to get underwater footage from that. It’s kinda important in a scuba show to have underwater footage, right? The weekend was amazing. There were people who came in from all over the US, and even a couple from Taiwan. (One of the couple was a US Expat living over there) Everyone had a great time meeting new people, trying out a new skill and bonding over shared experiences. I got to share some of my underwater and decompression tank time with Travis Marshall, a journalist from Scuba Diving magazine. He’s got a dream job. Getting paid to travel to great scuba locations and then write about it. He’s the guy in the deep tank helping me pull apart the dive platform. He also kept me from losing it in the deco chamber. (Thanks Travis!) I didn’t think I had a phobia of small spaces, but I nearly went nuts in the deco chamber. I’ll always listen to my dive computer so I never have to go in one again! But, I’d never make it as a Commercial Diver, since they use them all the time. I think Camp CDE was one of the most unique experiences I’ve ever had. I’m so glad I got to do it. Big thanks to everyone at Camp CDE for letting me come out and film. We’re re-doing the Going Down website. We’ve changed direction; we’re now focusing on becoming a web series. Hopefully, you’ll be able to sit at work dreaming of Scuba Diving, and now you can just hop on over to Going Down Online and see a new scuba destination. We’ve got a bunch of footage in the can, ready to be edited. I need to make an image map, so you can click on a scuba flag and it will take you to that Scuba Diving destination. I’m looking into some new places to go visit. Currently I’m in San Antonio, so if you’ve got a great local diving destination near San Antonio, I’d love to hear about it. Then we can come film the diving action and let everyone else see it too! We’re interested in what you do for the whole weekend. So dive bars, dive hotels, dive restaurants, dive clubs, the whole enchilada. So stay tuned for some new dive destinations on Going Down Online.